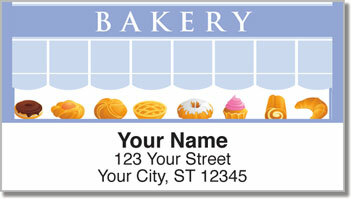 Who can resist the intoxicating aroma that wafts to the street from the corner bakery just as day is dawning? Not us, that's for sure! 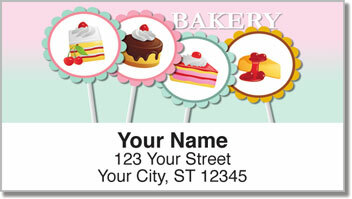 That's why we had one of our artists work up this cute set of designs to celebrate old-fashioned bakeries and the pastry chefs who create the carbo-loaded confections that some of us crave like crazy! 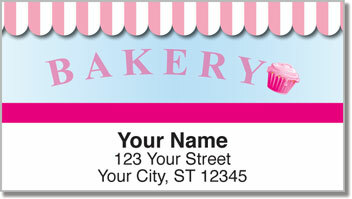 These personalized labels are a real time saver when it comes to putting your return address on outgoing mail. Plus, you can use them on books or DVDs, so the next time you loan one your borrower will have no trouble remembering where to return it. 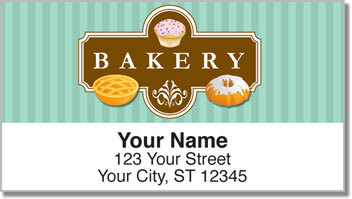 Make Bakery Address Labels and matching Bakery Personal Checks yours right now!